Intercom is a customer communication platform offering in-app chat, feedback gathering, and marketing tools to teams with a web, iOS or Android app. 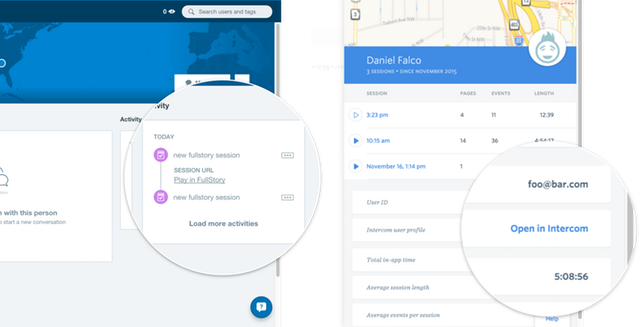 Our Intercom integration lets you jump to a customer's most recent FullStory session from within your Intercom dashboard, and puts a link to a customer’s Intercom profile in their FullStory user card. Click Connect and the integration will be configured. You should be able to see your Intercom App ID in the FullStory window. FullStory will now automatically pass new session URLs into Intercom on any page that is running both the FullStory and Intercom scripts. And as long as you use the same email or UID to identify in FullStory and Intercom, then you’ll also get a link to your customers’ Intercom profiles when you view their user cards in FullStory.